Ruffles are a perennial favorite for garments and home décor, adding a feminine element to any design. 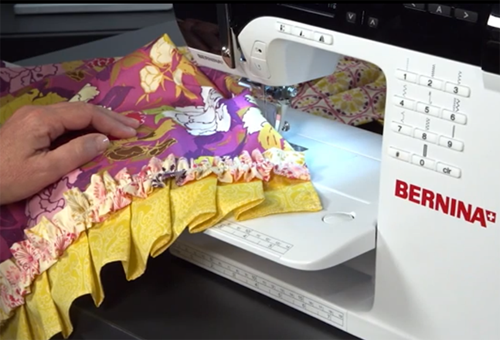 There are many different ways to gather fabric for ruffles, all of them easy to do. Join Connie as she demonstrates a very basic ruffling technique: Gathering fabric along two lines of long straight stitches. Where is the link found for this? I am using an Ipad. Sorry – the videos don’t work on tablets/phones at this time, only computers. I’m making 32 10″ ruffles and my machine does not have a ruffler….. so I’m doing this the old fashioned way. Two rows, as basting stitches…… after I make the ruffle, before I sew onto the fabric; I cut about 3/4″ strips out of muslin + the finished width. I sew the ruffle onto this small piece. Then I place my ruffle, which is now secure, onto the fabric and pin in place…. It sounds like extra work, but that strip makes placing the ruffle and finally sewing it down a whole lot easier!